The catehdral of St. Vitus in Prague is one of the most monumental cathedrals in Central Europe. Although primarily built in gothic style, this cathedral clearly displays a mixture of styles, from gothic, renaissance, baroque to even neo-gothic of the 19th century. The cathedral was finally completed in the 20th century. 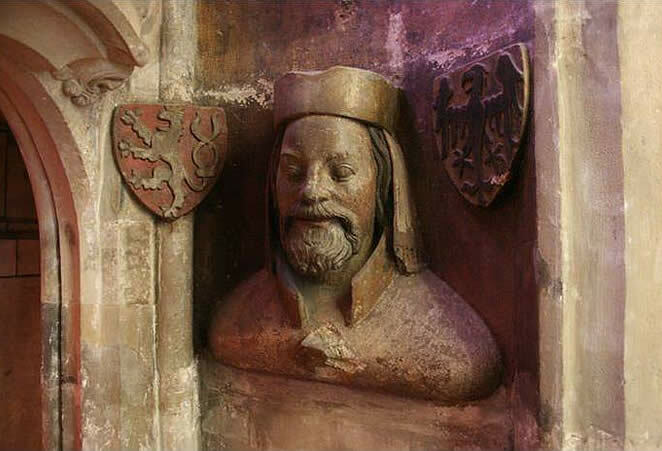 Fourteenth century in Czech history and art was marked by guise of Charles IV (1316 – 1378), who was a member of the Luxembourg dynasty. He received an excellent education at the Frankish court, where he married the emperor’s daughter, and, in her honor, renounced his name Wenceslaus. As a result of connection to pope Clement VI, who was in exile in Avignon, Prague was raised to archdiocese. By virtue of the pope, the German selectors pronounced him the Emperor of the Holy Roman Empire, and that title was confirmed by the coronation in Milan and Rome 6 years later. Charles ruled Bohemia before the crowning (since 1333) as his father’s regent, and after his father’s death he claims the throne (1346). Prag becomes the Empire’s capital city, and the emperor tends to make it a center of scholarship, so in 1348 he founds a university modelled on the one in Paris. By this, he attracts many great European scholars of that time. He sponsored art, supporting it by the foundation of the artists’ guild. Even whilst governing in Prague as his father’s regent, his influence was strong, and the rise of Prague apparent. The city was developing rapidly into an international cultural center worthy of Paris. After being raised to archdiocese, after founding of the University and getting the status of the capital city of the Empire, intensive construction begins in Prague. Beside the construction of the new cathedral, a few other reconstructions were undertaken, such as remodeling of the castle, the reconstruction of the Judith’s Bridge (later renamed Charles’ Bridge), and a few other buildings in the city, as well as outside of it. When in 1344 the Diocese of Prague was raised to archdiocese (up until then it was under Mainz jurisdiction), the representatives of ecclesiastical and secular authority decide to construct a new cathedral.1 The foundation stone had been laid the same year, and the construction began. The cathedral is 124 meters long, 60 meters wide in the transept, and the ceiling in the main nave reaches height of 33 meters. As it can be seen from the ground plan, this is a triple-aisled longitudinal building, ending with an apse. The chapels in the naves are square-shaped, whilst the chapels in the apse are semicircular radial. 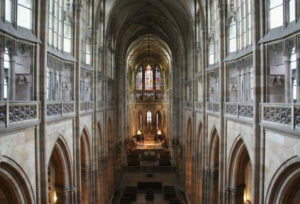 The Luxembourg dynasty, to which Charles belonged, was strongly connected to France, hence the first architect of the cathedral was Matias of Arras (Matthieu d´Arras). He designed and built parts of the choir, ambulatory and radiating chapel. Matias died in 1352, and soon after he is replaced by Peter Parler. He gave the church a true gothic appearance. He was a remarkable architect who didn’t necessarily follow the traditional appearance of gothic churches, but rather designed them as more innovative buildings. Parler watched over the construction of the cathedral until his death in 1399. During that period the choir and the most of the southern transept with tower were finished. In the upper part of the choir, which began constructing in 1344, the windows were moved further behind the line of the arcs, which creates an interesting effect of „windows inside windows“. The unusual impression is emphasized also by the fact that in front of the arcs’ zone there is a stone balustrade hollowed by an ornamental decoration. A three-storey elevation can be noticed in the choir (as well as in the rest of the building). The lower part consists of arcs, with triforium above them, and the already mentioned railing, above followed by the zone of windows. In triangular window tops there are ornamental floral patterns, different in each window. Displayed on the part of the wall above the arcs are crests of countries that donated the money to build the cathedral. The triforium is passable, and it contains a gallery of stone busts, each crafted differently; some are idealized, while some are realistic. They include the emperor, his family, the archbishops, and the architects Matias of Arras and Peter Parler. The last two busts are particularly interesting because they point out high social position of these architects. Architects in the Middle Ages were paid very well and socially ranked higher than all other artisans. 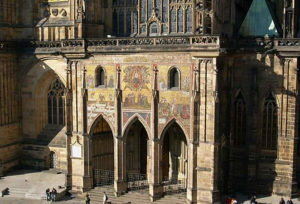 Exactly how high social status could medieval architects achieve, can be seen from the example of the two architects of the Prague cathedral. 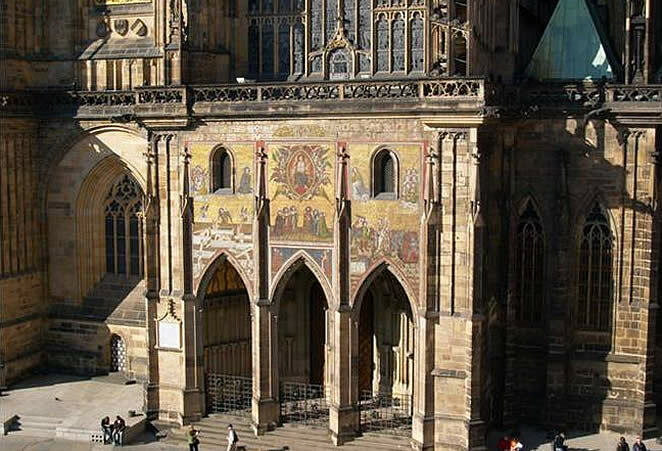 Both of them were buried in the center of the new choir of the cathedral, and even more importantly, they both had their portraits embossed in the triforium of the cathedral along with the emperor Charles and his family, and other Prague’s noblemen. Chief architects obviusly held a high position amongst the intercessors of the new cathedral and it was inadmissible that they be forgotten. The chapel of St. Wenceslaus is the most precious place in the cathedral, because it contains the remains of the protector of Bohemia. 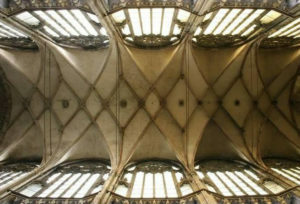 It was built between 1344 and 13462 and topped with Parler’s stellar vault. It is located precisely on top of the original place of his burial (above the southern apse of the rotunda from the 10th century which contained the saint’s sepulchre). 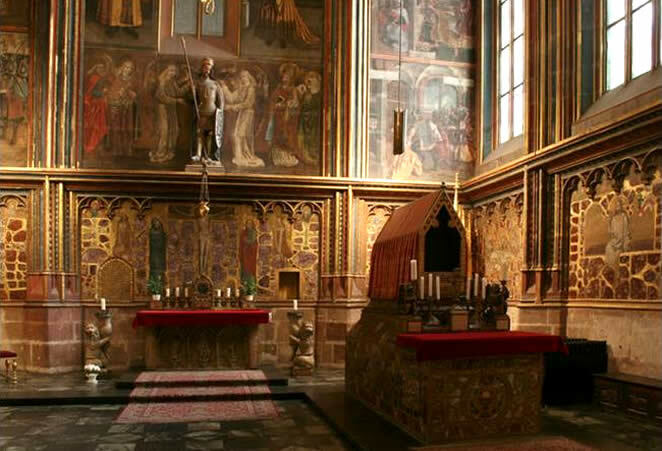 The decoration of the chapel is an example of high standards of the 14th century Czech art. The lower part of the walls is coated with semiprecious stones, amethyst mosaic, gilts and imitations of precious metals, and that part of the wall also contains a series picturing the Passion of the Christ painted between 1372 and 1373. Above that there is another series, spreading over all the walls, showing images from the life of St. Wenceslaus. Located in the center is the statue of the saint, made out of limestone, by Jindřich Parler (nephew of P. Parler). Over the chapel of St. Wenceslaus there is the crowning chamber, a room which holds the Bohemian Crown treasure (golden crowns, a golden apple and a sceptre). Charles’ Přemislad ancestors have been moved to the new crypts in the radial chapels of the choir, and the remains of St. Vitus have been moved to the ambulatory behind the high altar. Charles thought of the cathedral as his personal building, a sort of family mausoleum in radiatory chapels, so he took the opportunity to endue the church with valuables and relics. As not unexpected, he left a memento of himself and his family as well, in more than one decorative samples, which is also obvious from the busts in the triforium. The southern transept facade (built in the period from 1367 to 1368) consists of three passages with a classical arc shape. Nevertheless, what’s special about these portals is that they don’t contain any doors or tympan, instead they are completely hollow (like the arcs), and the doors themselves are pulled deeper inside the cathedral. Doorposts and transoms are richly filled with displays of stone baldachins (a decorative element that appears on the portals of the main facade as well), so that exceptionally decorative element substitutes the human figure. Above the arc portals is a depiction of The Last Judgement made in mosaic. In the 16th century the cathedral was upgraded with renaissance balustrades and towers, and in the 18th century some baroque elements were added as well. The great reconstruction of the cathedral began in 1872 in neo-gothic style, and the main portal was finished in 1929 anent the celebration of 1000th anniversary of death of Bohemian king and saint protector St. Wenceslaus. The most interesting thing that came out of the neo-gothic reconstruction is the painted window on the New archbishop’s chapel, with images from the Bohemian history with St. Cyril and St. Methodius. It was painted by the Czech artist Alfons Mucha in 1931. 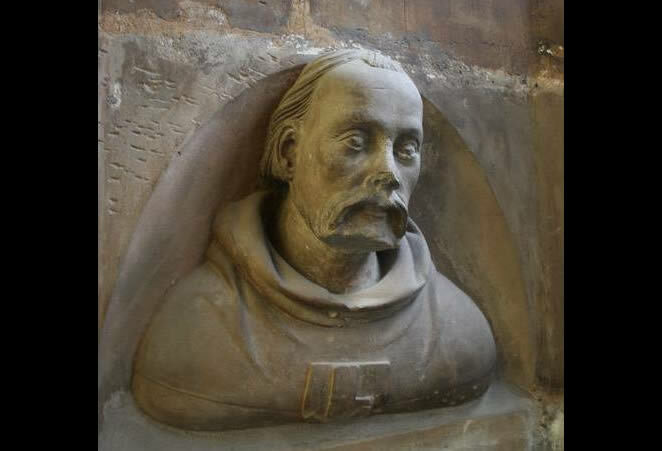 Peter Parler (1330.-1399.) is a gothic sculptor and architect. He was born into a family of stonecutters and architects, whose last name is derived from the word parlier (German for stonecutter). Not many details are known from his early life, but it is known that he learned his trade in the family workshop. 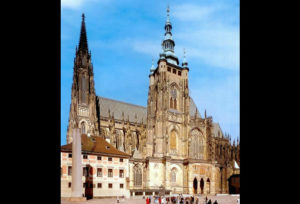 He was very talented, because already at the age of 23 (1353) the emperor Charles invited him to the new capital Prague, to take over the works on the Cathedral of St. Vitus, after the first architect. Matias of Arras, died a year 1352, only eight years from the beginning of its construction.3 Parler is creditable for most of today’s building’s appearance. He continues working for Charles IV through all his life, working on the cathedral, but also starting some new projects. He began working on the Church of St. Barbara in Kutná Hora in 1380. 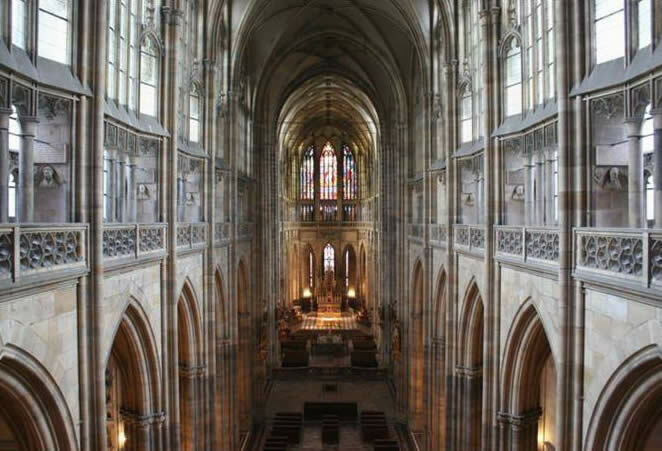 He also worked on the choir of the Church of St. Bartholomew in Kolín. 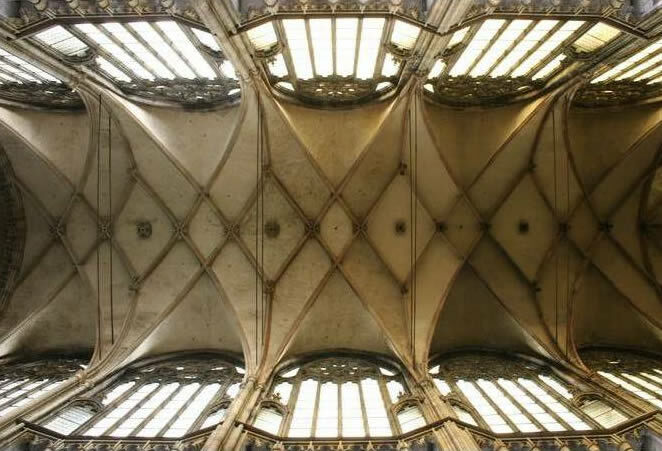 This project was unfinished during his lifetime, although it lasted for only two more centuries, unlike the cathedral of St. Vitus, which wasn’t finished until the 20th century. Aside from an architect, he was also very succesful as a sculptor. His most significant work are two busts in the triforium of the cathedral of St. Vitus – his self-portrait and a display of the emperor Charles. Peter Parler founded a successful workshop that worked on many projects.4 He was inherited by his son Johann, who started the works on the construction of the imperial residence in Kutná Hora. Peter died in 1399, in Prague, the city he enriched the most by his work. Middle of the 14th century was denoted by the artistic work of the Parler family, which leaves an indelible influence on architecture and sculpture of that period. When we speak of the Parlers, we can divide them on Bohemian and Austrian branches. At first, they operate in Germanic lands, and that part of the family is classified as the Austrian branch. However, when Peter goes to Prague on emperor’s invitation, he founds a successful workshop there, in which some of the members of the family operate as well (his nephew Jindřich and his son Johann), thereabout is formed the Bohemian branch. A special feature of their sculpture is their distinct realism especially present in portraits, as well as the display of entire human body. Even though the „Parler style“ is spoken of, many doubts involving the interpretation of certain artworks of some members of the family have never been fully resolved. And, even though the written documentation on the Parlers is still only fragmented, there is no doubt that Peter is the most notable member of the family. BILKOVA, H., Biseri praške arhitekture, Prag, 2003. COLDSTREAM, N. Medieval Architecture, Oxford, 2002. MARTINDALE, A., Gothic Art, London, 1985. (ur.) TOMAN, R., Gothic, Ullmann & Konemann, 2007. (ur.) GOLDSTAIN, S., Povijesni atlas, Zagreb, 1987. 1 (ur.) ROLF TOMAN, Gothic, Ullmann & Konemann, 2007., 209. 2 BILKOVA, H., Biseri praške arhitekture, Prag, 2003., 8. 3 (ur.) ROLF TOMAN, Gothic, Ullmann & Konemann, 2007., 209. 4 (ur.) ROLF TOMAN, Gothic, Ullmann & Konemann, 2007., 209. Being second generation American with Czech family traditions practiced at home; hearing Czech spoken by my parents, grand parents, and relatives; and having all my ancestors coming from Bohemia and Moravia, I enjoyed reading the historical information on the Czech people. Thank you for posting the information. @History Blog: what is the irony you’re seeing? tօ ɗо іt fоr уߋu? ԝould like tο ҡnoѡ աҺere u ǥot thіѕ from. Medieval Wall is a project that aims, in an understanding and interesting way, to bring Middle Ages closer to people.